In order to enhance the learning experiences of our undergraduate students, the Department of Chemistry provides many opportunities for our postgraduate students to contribute towards teaching. Such teaching predominantly occurs in our state-of-the-art undergraduate laboratories. Teaching enables our postgraduate students to maximise their potential to become world-class researchers by developing some of the attributes that constitute the Vitae Researcher Development Framework (RDF)1. Such skills development may include communicating science more effectively, working well in a team and managing their time efficiently. With the aim to facilitate excellent postgraduate teaching in the Department of Chemistry, we provide a bespoke internal training course for our postgraduate students as part of our innovative Doctoral Training in Chemistry (iDTC) programme2. The postgraduate teacher training course is led by Glenn Hurst and Rob Smith. As well as providing our trainees with the necessary pedagogical theory to understand and cater for a diverse range of students with multiple learning styles, the course is specifically designed to meet the demands of students studying chemistry and related subjects. This course is split into five stages. The learning outcomes of our training programme are clearly stated together with a summary of the course and a description of how we will assess the trainees. A vitally important part of our training is enabling our postgraduate students to become reflective teachers. To this end, we ask our trainees to create a personal teaching portfolio, where they reflect on the teaching, assessment and feedback that they provide during their training. This allows them to identify and develop skills that are directly aligned with the RDF. As most of the teaching our postgraduates will undertake occurs in the practical laboratory, it is necessary that our trainees are familiar with all safety procedures and the layout of the laboratory. Trainees are provided with a tour of the teaching space and they complete a quiz based on the safety information disseminated to them. Finally, trainees are invited to attend a meeting held by the organiser of the course they will be teaching on, where learning objectives, expectations of postgraduate teachers and assessment are discussed. 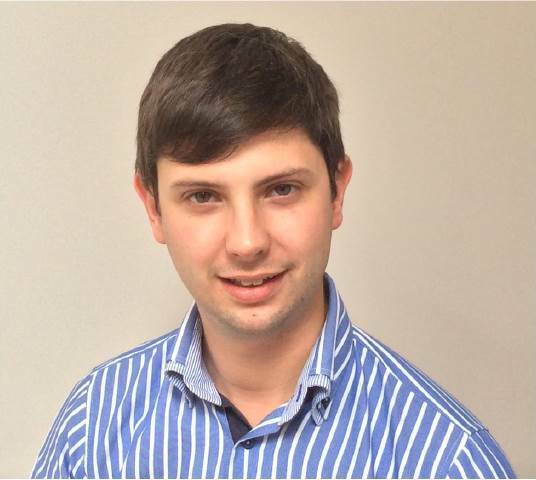 All trainees are assigned a personal mentor who is a trained postgraduate student that teaches in the Department of Chemistry. Trainees will initially shadow their mentor in order to observe and record good teaching practice. The trainee should focus on how to give experimental briefings to our undergraduate students, how to provide effective feedback, lab management and both in-lab and out-of-lab assessment. As part of our customised training, stages 2 and 3 comprise of trainees attending two workshops devoted to “Communication Skills” and “Assessment and Feedback”. A large emphasis is placed on actively training our postgraduate students how to act in common learning scenarios. Trainees are divided into small groups (three or four) in order to foster active participation and are subsequently asked as a group to consider various key questions with regard to communication in teaching. Groups subsequently draw their “ideal postgraduate teacher”, identifying positive characteristics. As well as this being an activity to demonstrate working as part of a team to consider the subject based on previous experiences, it is useful to the facilitator of the session to determine the base understanding of a group of trainees and adjust the session accordingly. The pedagogical reasoning that forms the basis of the relevant teaching activities the trainees will undertake is clearly articulated. We believe this contributed to the high level of engagement observed from our trainees. Bloom’s taxonomy is introduced (a good discussion is provided by Biggs and Tang3), whilst explaining to the trainees how active teaching can help reduce the difference between surface and deep learning. We feel that in doing this, the trainees can more easily understand why we want to teach our undergraduates in a particular way and subsequently aspire to teach in a way that facilitates high quality learning. The importance of Specific, Measurable, Attainable, Results-Focused and Time-Bound (SMART) learning objectives is highlighted. They are subsequently linked with assessment criteria. It is then explained to the trainees how we aim to achieve constructive alignment throughout our teaching in the Department of Chemistry in order to facilitate deep learning. The trainees are recommended to make the learning objectives clear to our undergraduate students during teaching sessions. This includes defining how they will be achieved and, finally, how they will be assessed. Using the Kolb learning cycle, trainees are asked to decide what type of learner they are. This outlines to our trainees that our undergraduate students all possess different learning styles and that the teaching they provide must be inclusive. Individual groups of trainees engage in microteaching whereby they construct and deliver a scientific briefing to another group (as they would be expected to do with our undergraduate students in our teaching laboratory). Groups then receive feedback from one another. By specifically performing a briefing in the workshop, we hope that our trainees will be better equipped to communicate with our undergraduate students than if a passive learning activity had been utilised. Finally, protected characteristics are discussed and the trainees are each provided with a common teaching scenario where they are asked to discuss how they should behave in order to create a diverse and inclusive learning environment. By engaging in activities to facilitate active learning, we hope that our trainees can appreciate why consistent and fair assessment that is aligned with our learning objectives is crucial throughout our teaching in the Department of Chemistry. We discuss with our trainees how we assess undergraduate students, linking this practice to the pedagogical literature. Trainees then consider the expectations of our undergraduate students regarding assessment and to what extent this contributes to postgraduate teaching. In order to highlight the necessity of consistent assessment, trainees are initially asked to provide a grade for a chemical mechanism containing a mistake without being given any marking criteria. Trainees move around the teaching space to stand in a location that coincides with the grade they would like to provide. As expected, a large range of grades is generated depending upon the interpretation of the chemical mechanism. As a related point, by asking our trainees to move around the teaching space with specific tasks to complete, it is hoped to contribute towards the development of an active classroom, whilst specifically catering for an “activist” learning style. The trainees are subsequently provided with a “real” undergraduate lab manuscript together with marking criteria and asked to assess the report individually without discussing this with their colleagues. The assessment grades are collated. 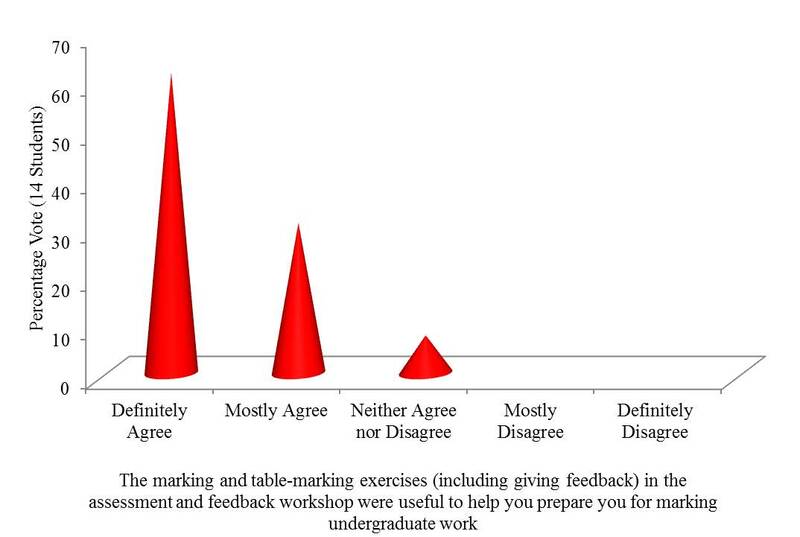 The concept of table marking is subsequently introduced where following a group discussion of the manuscript and the marking criteria, the trainees agree a mark based on this. Finally, students are provided with a new manuscript and asked to assign an individual mark based on previous discussions. All students found the table marking exercise very useful. Our trainees are taught how to give constructive feedback that allows our undergraduate students to learn from their comments, feeding forward to future assignments. The importance of providing students with positive feedback is specifically highlighted. Trainees provide written feedback on the manuscript they previously assessed. This is disseminated to the class and discussed. By physically giving written feedback within the workshop, the trainees are able to see how the fundamental principles of providing excellent feedback can be specifically applied to the teaching they will encounter. Finally, students are taught how to give oral feedback in their teaching sessions. Trainees observe a role play between Glenn and Rob simulating an in-lab student-postgraduate teacher assessment and feedback experience. This is recorded as a video and made available on the Yorkshare Virtual Learning Environment for further analysis. Following the workshops, trainees go into our teaching laboratory with their mentor and put what they have learned into practice. Trainees are required to give one briefing, teach undergraduate students in the laboratory, assess student manuscripts and deliver a feedback session. The manuscripts the students assess are table-marked and double-marked with their mentor to maintain a high level of consistency of assessment. Throughout this process, their mentor will provide oral and written feedback, allowing our trainees to improve. During this time, our trainees complete their personal teaching portfolio, prompting them to reflect and develop the teaching they provide to our undergraduate students. The personal teaching portfolio is utilised to identify the skills the trainees have developed throughout the training course and align these with the RDF. Trainees work in pairs to identify and discuss a recent activity they performed and the associated skills they developed. This is conducted in order to enhance their interview skills by drawing upon relevant experiences. Trainees are informed how to construct a Situation, Task, Activity and Result (STAR) answer to an interview question and subsequently repeat the aforementioned activity in pairs, detailing an occasion where they struggled and how they managed the situation. Pending satisfactory session attendance, mentor feedback and completion of their personal teaching portfolio, trainees will have passed the training course. They can then engage with teaching our undergraduates in the Department of Chemistry. If a trainee is found to have particular difficulties with teaching our undergraduates, further training is provided by Glenn and Rob (this may be in the form of further in-lab experience with their mentor for instance) until both the trainee and staff are satisfied with their teaching practice. Our postgraduate students are able to contribute towards undergraduate teaching in other ways besides teaching practical skills such as assisting in workshops and aiding towards the development of current/novel teaching experiments. This training course (or aspects of it) could serve as a model to train postgraduate students how to teach undergraduate cohorts in other departments or institutions. Future work will comprise of enhancing the quality of training provided to our mentors, to ensure the mentoring and the feedback they provide is to a consistently high standard. This will hopefully further improve the quality of our postgraduate teaching training course, enhancing the learning experience that they facilitate for our undergraduate students. We would like to thank Sue Couling, whose earlier work in training postgraduates who teach in the Department of Chemistry served as the foundation for the programme reported here. 3: Biggs, J. B. and Tang, C. (2007) Teaching for Quality Learning at University. Open University Press/Mc Graw-Hill Education.